Around the world, the Sufis are struggling against violent fundamentalists who are at once their deadly foes, and ours. To look at Islam without seeing the Sufis is to be ignorant of a crucial clash of civilizations in today's world: not the conflict between Islam and the West, but an epochal struggle within Islam itself. If the word "Sufi" conjures up any images for Americans, they normally involve mystical poetry or dance. Thirteenth century poet Rumi was a legendary Sufi, as are Turkey's whirling dervishes. But these are just the most visible expressions of a movement that runs deeply through the last thousand years of Islam. Emerging around the year 800, they were originally pious devotees, whose poor woolen clothes showed their humility: "Sufi" comes from the Arabic word for wool. Above all, the Sufis sought the divine reality or ultimate truth that stands above all the illusions and deceptions of the material world. In order to achieve ecstatic union with God, they incorporated techniques of sound and movement -- chanting and music, swaying and dance. Believers joined in tight-knit brotherhoods or tariqahs, each following a charismatic leader (shaykh). Among the dozens of these orders, a few grew to achieve special influence, and some operate in dozens of nations, including the United States. Over the centuries, the territories where Sufi orders seeded Islam have evolved from the faith's frontiers to its demographic heartlands. These regions now encompass Islam's largest and fastest-growing populations. Of the eight nations with the world's largest Muslim communities, only one (Egypt) is Arab. A fifth of the world's Muslims today identify with Sufism, and for many millions more, Sufism is simply part of the air they breathe. The Sufi orders enhanced their political role as Western empires encroached. When Islam was under threat, the Sufis were the trained soldiers, and their close-knit brotherhoods allowed them to form devastatingly effective resistance movements. Sufi orders led anti-colonial movements from Morocco to Indonesia. Most Americans, for instance, have heard of the stubborn Chechen guerrillas, but few realize how absolutely this movement is rooted in Sufism. When the Russians pushed south into Muslim lands in the 19th century, the heroic Sufi sheikh Imam Shamil launched a decades-long guerrilla war. Even Stalin's terror campaigns could not root out the Sufi brotherhoods. The fearsome leader of modern-day Chechen resistance, Shamil Basayev, was named for the original imam. The Sufis might sound like America's worst nightmare. Not only do they ground political activism in religion, but their faith spreads through intense and secretive brotherhoods, led by charismatic masters: this recalls every sinister stereotype of Muslim fanaticism that potboiler thrillers have offered us over the decades. But it would be a terrible mistake to see the Sufis as enemies. Sufis certainly have fought Western forces through the years, and Sufi-founded movements have on occasion engaged in terrorist actions -- witness the Chechens. But in the vast majority of cases, such militancy has been essentially defensive, resisting brutal colonial occupations. This is very different from the aggressive global confrontation pursued by groups such as Al Qaeda. But the Sufis are much more than tactical allies for the West: they are, potentially, the greatest hope for pluralism and democracy within Muslim nations. The Sufi religious outlook has little of the uncompromising intolerance that characterizes the fundamentalists. They have no fear of music, poetry, and other artistic forms -- these are central to their sense of the faith's beauty -- and the brotherhoods cherish intellectual exploration. Progressive Sufi thinkers are quite open to modern knowledge and science. As fundamentalist Islam spreads around the world, Sufism is one of its targets, even in such strongholds as Indonesia, Pakistan, and Nigeria. Often this comes in the form of ideological struggle, but open violence has broken out as well. Sudan's Islamist government attacks the black Sufi population of Darfur; in Iraq, suicide bombers target Sufi centers. Sufis have literally everything to lose from the continued advance of the Islamist extremists. But Sufis are anything but passive victims, and in their resilience lies their true importance to the West. In many nations, Sufi brotherhoods exercise influence within local regimes, and those alliances allow them to drive back radicalism. Sufi brotherhoods have emerged as critical supporters of government in several post-Communist regimes, including in former Yugoslav regions like Kosovo and Bosnia, and in Albania. When a Qaeda-affiliated Islamist movement arose in Uzbekistan, the government's intimate alliance with the Sufi orders allowed it to destroy the insurgents quite thoroughly. Syria cultivates tolerant-minded Sufi orders as the best means of fending off Islamist subversion. For similar reasons, even the Chinese government openly favors Sufism. Hard as they try, fundamentalist radicals find it impossible to gain much of a foothold in societies where Islam is synonymous with Sufism, and where Sufi loyalty is deeply tied to cultural and national identity. In 2007, the influential RAND Corporation issued a major report titled "Building Moderate Muslim Networks," which urged the US government to form links with Muslim groups that opposed Islamist extremism. The report stressed the Sufi role as moderate traditionalists open to change, and thus as potential allies against violence. Sufis, better than anyone, can tell disaffected young Muslims that the quest for peace is not a surrender to Western oppression, still less a betrayal of Islam, but rather a return to the faith's deepest roots. And while Sufis have religious reasons for favoring peaceful and orderly societies, they also stand to benefit mightily from government support in their struggle against the fanatics. As the fundamentalists have expanded, they press hard on Muslim populations who are overwhelmingly drawn from countries where the Sufi current has always dominated Islamic life, from Pakistan, Turkey, and North Africa. Nobody is pretending that building bridges with Sufis will resolve the many problems that divide the West from the Islamic world. In countries like Afghanistan or Somalia, warfare and violence might be so deeply engraved into the culture that they can never be expunged. Yet in so many lands, reviving Sufi traditions provide an effective bastion against terrorism, much stronger than anything the West could supply by military means alone. The West's best hope for global peace is not a decline or secularization of Islam, but rather a renewal and strengthening of that faith, and above all of its spiritual and mystical dimensions. Philip Jenkins is Distinguished Senior Fellow at the Institute for Studies of Religion at Baylor University. He is author of "The Lost History of Christianity: The Thousand-Year Golden Age of the Church in the Middle East, Africa, and Asia -- and How It Died" (HarperOne, 2008). 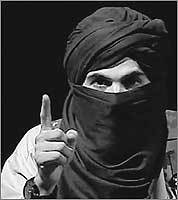 (AP/Getty Images) An extremist presumed to be with Al Qaeda threatens Germany in a recent video.